Shortly before his death in 1464 Cosimo de' Medici devoted himself to creating a great scholarly library at the Badia Fiesolana, located between the two Medici Villas at Fiesole and Careggi. Under Lorenzo the Magnificent, who enthusiastically continued his grandfather's enterprise, the library became celebrated as one of the meeting places of a Literary Academy, frequented by such luminaries as Angelo Poliziano and Giovanni Pico della Mirandola, who both composed important works there. The library had been stocked by the famous bookseller Vespasiano da Bisticci with more than 200 manuscripts. The formation of this library is exceptional in two ways. Firstly, the enormous speed of stocking the library within two years is unparalleled in Italy, and secondly the acquisition policy, which followed the bibliographic canon of pope Nicholas V, while carefully modifying it so as to support scholarly studies at a university level. 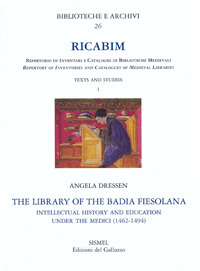 Thus the Badia Fiesolana possessed the only library exclusively offering purposely chosen titles. The inventory of about 1464 is here published for the first time. In shedding new light on a humanist lyceum, this study closely scrutinizes humanist and university education in Florence and Italy. It provides a comparative treatment of university and monastic teaching, discussing both courses and library inventories.